IndiaNIC always believes in rewarding exemplary teams and individual performers with valuable awards and recognitions. Marching its effort towards making a rewarding work environment, on Friday 25th October, it announced the quarterly awards and the winning team of the Counter Strike Battle Competition. This was the much awaited event for the IndiaNICians. The quarterly event uncovered some of the best talents nurtured by IndiaNIC. There were a lot of awards lined up for IndiaNICians. There were different award categories such as best projects, best designs, star performer, best contributors and reward from the clients. The winner’s trophy for the CS battle competition was also supposed to be given. The event kicked off on the beats of some stunning music that captivated the attention of all the tech geeks on the floor. Initially, anchors of the event specified the criteria and parameters for the awards. They also gave an overview and significance of such events. All the employees had their eyes and ears on the event. It was time to celebrate the outcome of their persistent and sincere effort towards the company. At the beginning, the award for the best project was given followed by the star performers of the respective projects. 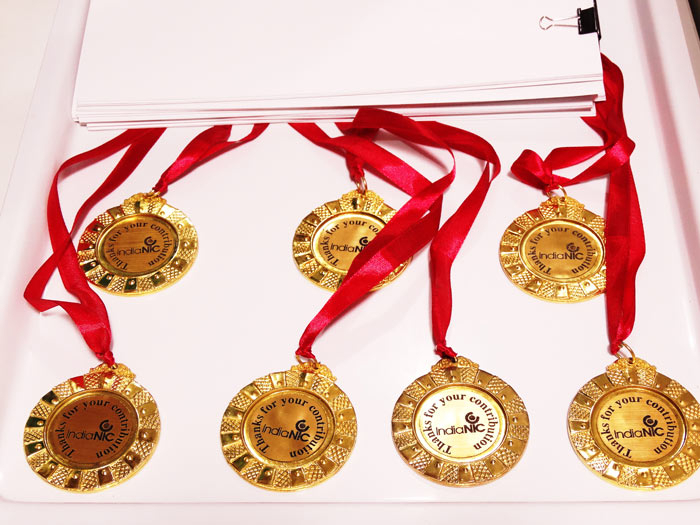 Then, individual awards were given for the best designs. In addition to the trophies, there were bounties given from the client side also. The other contributors received medallions and certificates. At the end of the event, IndiaNICians celebrated the birthday event for the month of October. This concluded the program, which was filled with enthusiasm and curiosity. On one hand, where employees managed to get multiple awards, on the other hand, they celebrated the success of their teams and team members. Such events promote a vibrant work atmosphere in the company and push the employee to innovate beyond imagination. The management members congratulated winners and encouraged everyone to persistently deliver the best IT solutions to their global clients.